We have been running our 'Caring for You' events since 2011 and they have become more and more popular with our members. 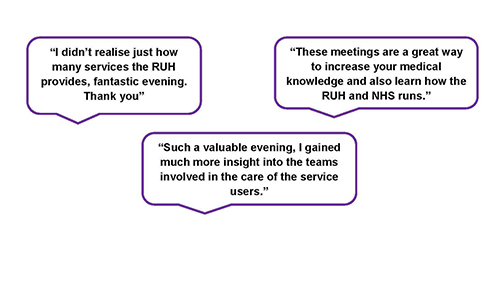 Our events give our members and the public the opportunity to step behind the scenes and understand more about the work of the hospital and how it supports the health and well-being of the local communities. Each year we ask our members what topics they would be interested in hearing about and the top six topics make it onto the agenda. A typical event is usually presentation based where you will learn more about different specialties and conditions from a guest speaker or team, and you may even get the opportunity to go behind the scenes or take part in hands on activities. There is always a Q&A session where you can ask questions to the professionals. You also have the opportunity to have a cup of tea and meet your RUH Governors. All of our 'Caring for You' events take place in the Post Graduate Medical Centre (PGMC), RUH (Dept. B20) and begin at 6pm.